Florida State has finally solved its quarterback depth problem for 2019. After a weekend visit to campus, Alex Hornibrook, a graduate transfer from Wisconsin, announced that he will play his final season of college football for the Seminoles. He is eligible immediately. Since the tumultuous departure of Deondre Francois, FSU has been desperately pursuing help at the quarterback position. Willie Taggart’s staff struck out a few times late in the 2019 recruiting cycle and also whiffed on a few other graduate transfers, but is bringing in an experienced player in Hornibrook. Hornibrook, a 6-foot-4 lefty, was a three-year starter at Wisconsin, compiling a 26-6 record in those starts. He showed some flashes of promise, but could be a source of frustration for Badgers fans. After redshirting his first season with the program, Hornibrook became the team’s starter in 2016 as a redshirt freshman, but often split time with senior Bart Houston. In 2017, he took the reins full-time and threw for 2,644 yards, 25 touchdowns and 15 interceptions, including an awesome performance — 258 yards and four touchdowns — in Wisconsin’s Orange Bowl victory over Miami. Wisconsin had College Football Playoff aspirations entering 2018, but fell short. 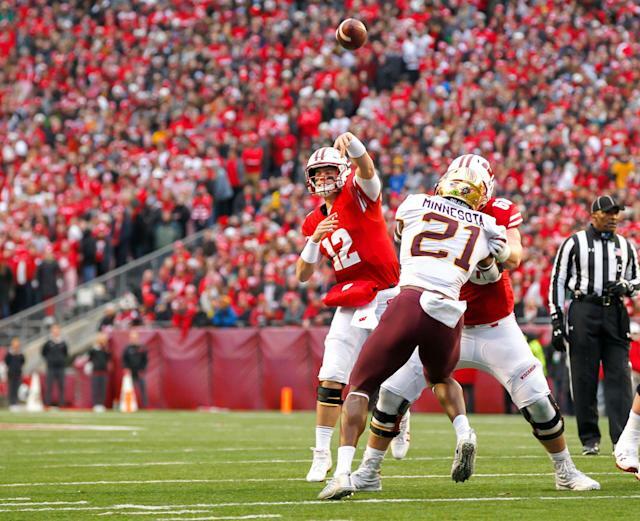 In nine starts, Hornibrook threw for 1,532 yards, 13 touchdowns and 11 interceptions while completing 59.5 percent of his passes. He missed multiple games late in the year while dealing with concussion issues. The Badgers finished the season with an 8-5 record. Francois, who was dismissed from the program last month, was Florida State’s starting quarterback in 2016 and 2018. In 2017, when Francois was injured, James Blackman filled in. In the time since Francois’ departure, Blackman has been the only eligible scholarship quarterback on campus. As a true freshman in 2017, Blackman threw for 2,230 yards, 19 touchdowns and 11 interceptions. He competed with Francois for the starting role entering 2018, Taggart’s first season as FSU’s head coach, but Francois won the job. Based on his time in Tallahassee so far, Blackman presumably has the inside track to start over Hornibrook — but at least there’s some competition now. Beyond those two, FSU has Louisville transfer Jordan Travis, but he is not expected to eligible in 2019 unless the NCAA grants him a waiver. Rounding out the quarterback depth chart are walk-on Nolan McDonald and Western Michigan transfer Wyatt Rector, who will reportedly enroll in May. Florida State went 5-7 in 2018, missing a bowl game for the first time since 1981.